The great horned owl (Bubo virginianus) or tiger owl is probably the heaviest owl species in South America. In North America, the snowy owl is the heaviest specimen which is only slightly greater than the great horned owl. As in all raptors, the female is 20% heavier than the male. Since there are more than 10 recognized subspecies of a great horned owl, their weight varies significantly depending on the location. Let’s see how much do great horned owls weigh in the wild. 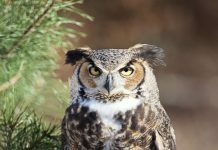 Great Horned Owl – How Much Does a Great Horned Owl Weigh? 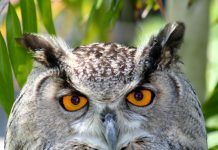 The heaviest population of great horned owls is found in Ontario and Alaska whereas those inhabiting Texas and California are thought to be the smallest subspecies. The average body weight of a female great horned owl is estimated at 3.545 lb (1,608 grams) whereas the male averages at 2.698 lb (1,224 grams). The heaviest great horned owl every weighed at 5.518 lb (2,503 grams). 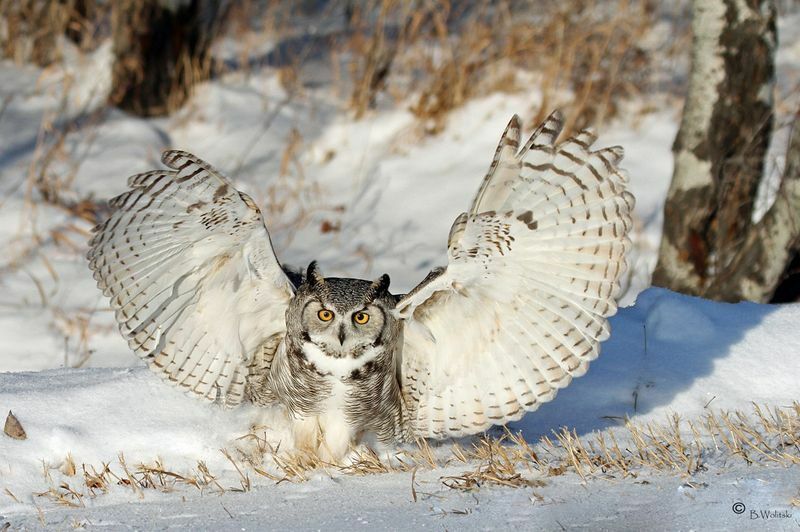 While the owl’s wings cover less surface-to-area volume they are nevertheless the heaviest of all raptors. This is quite evident when the bird is sitting on its nest. Like other owls, the great horned owl has a pretty small tail—perhaps not a prominent owl’s feature and can barely be noticed. Snyder, N. F. R. and J. W. Wiley. 1976. 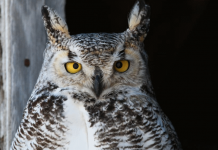 Sexual size dimorphism in hawks and owls of North America. AOU Ornithological Monograph, 20:1-96.